Its new compact kiosk bakery is set to open in 30 locations within the next 4 years. 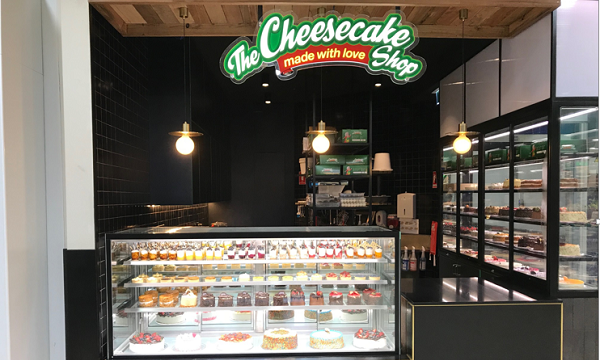 Opened at Marketplace Leichhardt, the shop is a fraction of the original size of The Cheesecake Shop store with 15 square metres. General manager of franchise development Nick Avgerinos said, “A smaller store footprint means less rent, a reduction in fitout cost and less to spend on ongoing maintenance. This new format will hopefully attract a new wave of franchisees who are chasing the dream of owning their own business." “A dark monochromatic palette was selected to enable the cakes to stand out as much as possible, ensuring the products are the hero of the display and allowing for a backdrop to be created to the theatre of artisanal cake decorating. In conclusion the new design seeks to be applicable to any situation and with the vision of expanding successfully into new areas and demographics,” added designer Edward De Simone of De Simone Design. The Cheesecake Shop has developed new product offerings to appeal to the smaller family sizes and different tastes and preferences of inner city inhabitants where the new kiosks will be located. Mini Cakes have been introduced in a variety of the brand’s tortes and a new Temptations range, including treat size cheesecake desserts and a selection of tarts. The Kiosk at Leichhardt will be led by Pastry Chef Paul Leiron.